After having Matt home for over a week during Christmas we wanted to make the most of the sunshine and do something really lovely for his last day off before it was back to the normal work routine. We also didn't want to spend much (in additional to the normal Christmas expenses, a stone hit our windscreen on the way to visit family so we have an insurance excess of £75 for the replacement windscreen to stump up this week). Fortunately we invest in national Trust membership and are in a part of the country with plenty of NT properties, so there is always a great selection of free days out to choose from within an hour's drive. Much of what we enjoy about the parks and gardens could be achieved through visiting public woods and parks, but to be perfectly honest it's the absence of dog muck that draws us as much as anything else the NT has on offer. I can't put a price on the freedom for the kids to kick around in piles of leaves and roll on the grass without my constant 'not there, it's full of poo'. On Sunday we decided to visit Sheffield Park again (which is in East Sussex, not Sheffield). 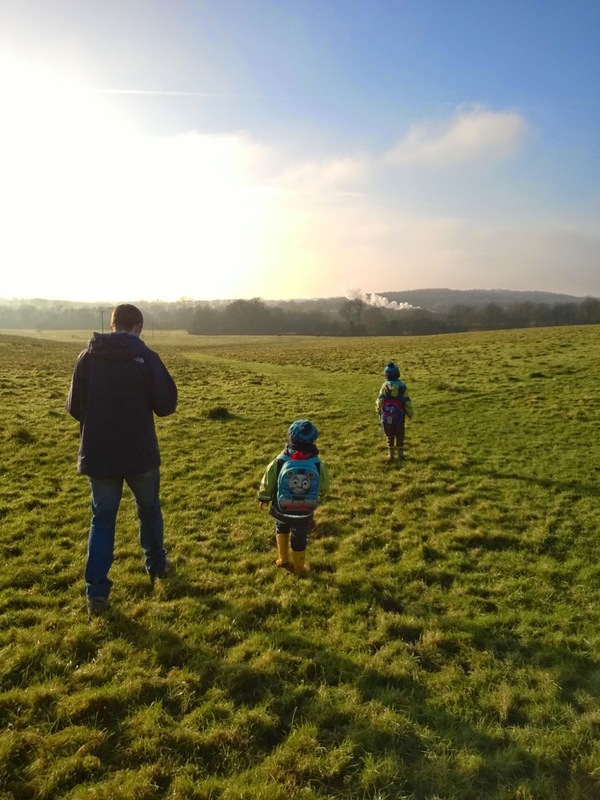 After exploring the beautiful 'Capability' Brown landscaped gardens and Toby's favourite bridge over a rushing weir we decided to do something new and head out over the fields with the free map provided on entry to the site. 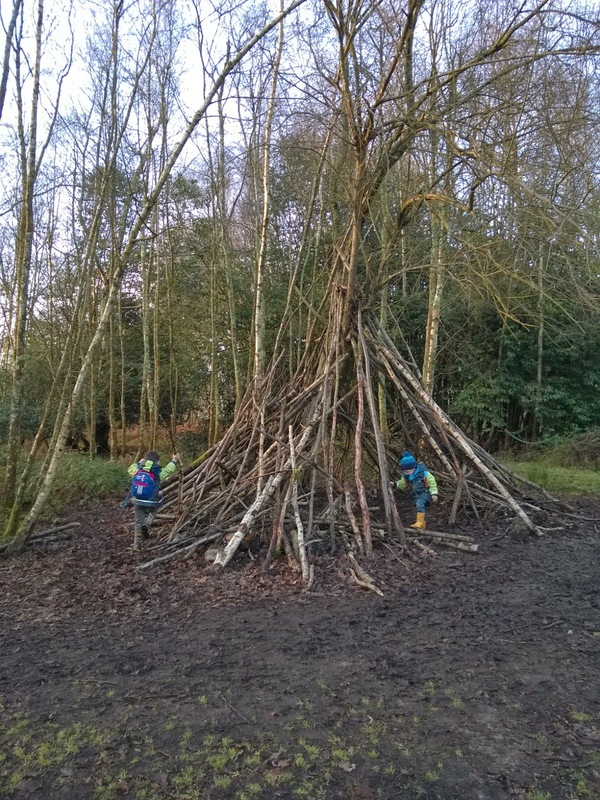 We wanted to build on the boys map reading skills and using the simply drawn, clear map to find the woodland play area was an ideal opportunity. The countryside surrounding Sheffield Park is made up of gently rolling farmland and small woods and in the photograph the white smoke visible is from a Steam Train on the Bluebell Railway. The station is a ten minute walk from Sheffield Park, so if you're travelling without a car you can get public transport to East Grinstead and then catch the steamy the rest of the way. 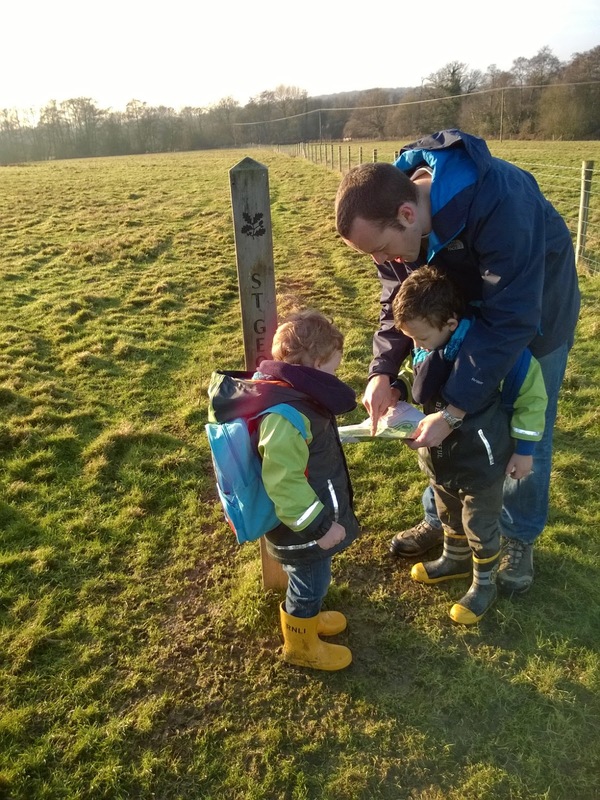 The first job in learning to map read is to orientate yourself - working out which way up to hold the map by looking for things you recognise on it, so this is what we did with the boys, first at the gate to the car park and then at every signpost. It's a much more complex skill to hold the map with North up and then work out which way to walk if you're not going North than to simply turn the map to the direction you are going in. The landmarks drawn on the map were all clear and easy to pick out for the boys, including a fence with a gate and small woodlands. It was also a great place to start map reading because there was zero chance of getting lost with the open site and the provision of regular signposts. Using a map in the real world builds on from the map games we play at home, drawing maps of the house and then hiding treasure and marking it on the map. The biggest challenge was helping the boys visualise what they were looking at on the map by frequently stopping and looking carefully at the surroundings. If you pointed to the woods on the map they would tell you they were woods, but then asked to point to the woods shown on the map in the real world caused confusion about what side of the path they were on. They picked it up pretty quickly though and we had no trouble finding the woodland which contained the play trail. As we entered the wood it was thick with mud and there was no play equipment in sight at first, but then we rounded a corner, the paths dried out and the den building area appeared. This is an activity the boys will spend all day doing given the opportunity, and they had soon co-opted in other children to help. A little boy approached Toby and said 'hello I'm Tom'. Toby looked at him for a minute and then said 'hello Tom, you help me build a fireplace please', which given his history of speech delay was a really exciting moment for me (he used his own name for the first time on his third birthday a few weeks ago - 'Toby' instead of 'beh beh'). We had great fun building, but took a break part way through to take our turns on the brilliant rope swing suspended from a grand old tree. 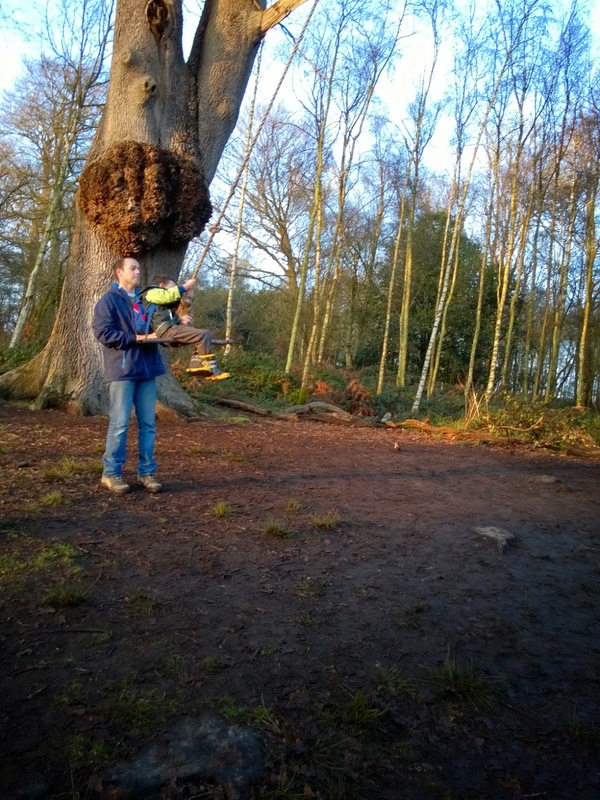 The National Trust have really embraced the concept of introducing the adventurous and slightly risky activities that children need to develop skills such as balance and risk awareness. 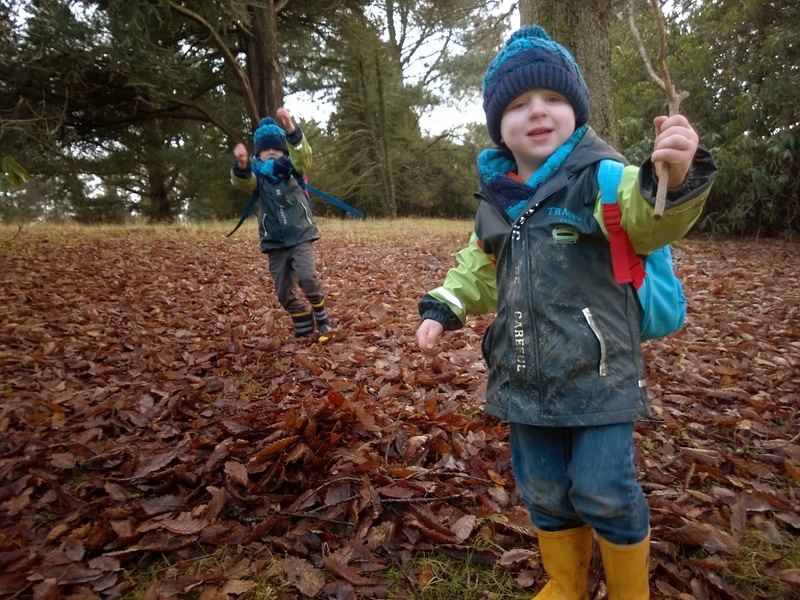 Slipping in mud, balancing on logs, playing with their whole bodies as they climb and swing and run is necessary to children's proper development and as well as the more sedate opportunities to admire flowers and grand buildings, the National Trust has also started to provide opportunities for adventurous play across many of their properties. 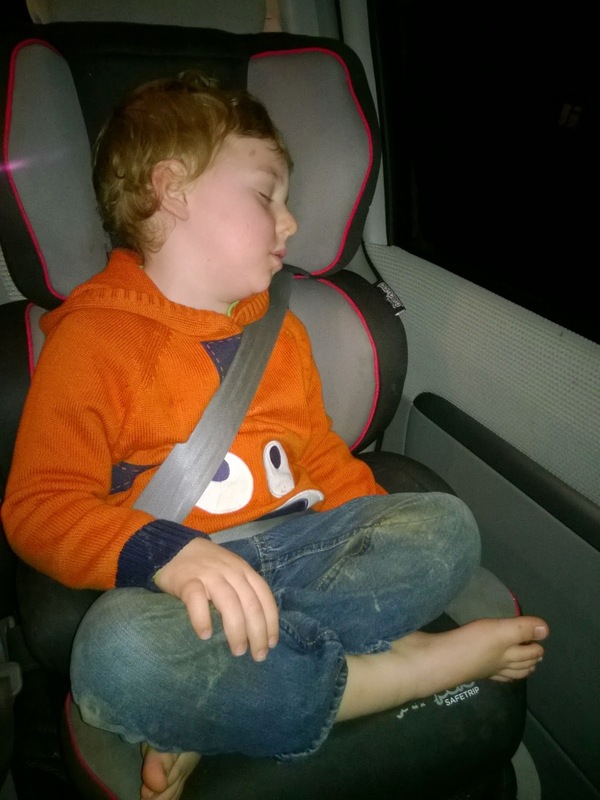 It turned out to be a very long day as Toby slept so deeply in the car on the way home that he then didn't go back to sleep until nearly 11pm and spent the evening lamenting the stick he'd had to leave behind, but the mud in the bottom of the bath at bedtime attested to how good a day the boys had, and they were still talking excitedly about what they had done the next day and asking to go back again soon. I'm sure it is somewhere we will return to again and again.